Words of power are coming to the Faire for our second Literary Festival (LitFest)! Over the ten days of the LitFest, there will be talks by authors, discussions, creative writing sessions and performances. This year the emphasis is on creation, as a number of the leaders of creative writing groups in Second Life bring their regular events to the Faire, and welcome newcomers who want to join in with such events as the “Poetry Prompt” with Leslye Writer, where people are given a prompt word and write for 20 minutes then share what they’ve written or the “SL Flickr Photo Story Challenge for Beginners” with Prettyflower Vale. And there is our own special daily story and poetry writing challenge. Every day, we will be inviting you to put your Fantasy Faire experience into words. 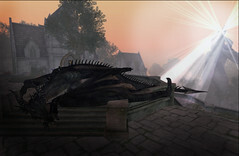 The Faire is brimming with stories: breathtaking builds and fantastical creations designed to touch your heart and soul. What stories do they inspire in you? Brand new to Fantasy Faire’s LitFest this year are our LitFest Tours, leaving daily from our home base on OtherWorld to explore the Fantasy Faire Continent. We have been seeking the stories of the Fairelands – along with special secret places and details, and each day a Guide will lead a tour to one of the Fantasy regions. Explore … and open yourself up to what inspires you, what detail or overall impression sparks a poem, micro-fiction, or short story. You can see more about the LitFest Region Tours here. With only ten days, our Tour focuses on just ten of the regions, but we hope you’ll be inspired by other regions too, to share stories. And to lead that, we have a talk by HaveitNeox and Lilia Artis telling the wonderful story behind Sapphire Mirror Lake. The LitFest has its home in the crystal pavilion on the heights of OtherWorld, created by Elicio Ember. But we hope you will explore the beauties of other worlds and discover its secret, beautiful lounges, areas to be inspired to create, or to continue the discussion from LitFest. Because we have some fascinating discussions planned. They include ‘The Short Story Discussion Group’ with Destry Recreant, who will choose fantasy stories by well-known authors for us to discuss. This event has been going for years and there’s always a great discussion. And there’s Speculative Fiction Saturday – led by Simeon Beresford – science fiction and fantasy discussion with audience participation compulsory! We have authors reading their works – including Ceejay Writer (Lori Alden Holuta) who’ll be reading a chapter from “Down The Tubes”, the 2nd novel in The Brassbright Chronicles, and Ryanna Foxclaw (Nova Mitchell), who will be reading an excerpt from “Past’s Prologue : Shadow Wars”. We’ll have a presentation from Freyja Nemeth (Linda Antonsson) on ‘Building Imaginary Worlds’ something Freyja has learned rather a lot about as she is the co-author of The World of Ice and Fire, which explores the history and cultures of Westeros and Essos, and the co-owner of Westeros.org. She is also a student of literature with a particular focus on world-building in fantasy novels. Her lecture takes a look at some of the key elements involved in constructing a believable secondary world, with examples drawn primarily from George R.R. Martin’s A Song of Ice and Fire. We also have talks from people involved in the stories that underlie two very different regions: Bookworm Heinrichs, who will be telling us about organic literary growth in the steampunk city of New Babbage, and Ketsui Naidoo, who will be sharing tales of the beautiful, magical land of Ashenborne. Then we will have storytelling with Caledonia Skytower, Shandon Loring, Boudicaa Amat, Gyro Muggins, Viginia, Arik the Red and more. We have Open Mic sessions led by well known poets and writers including Adele Ward and Wolfie, and session which open with reading but which invite the audience to contribute too. And then there are performances for Shakespeare’s Day with The Fairelands Players in a magical production of A Midsummer Night’s Dream, and a modern modern retelling of The Tempest with the Coldshot Players. Read more about Shakespeare Day here. And this is just a selection of the fabulous events at the LitFest! Do check out the full schedule (and we’re still adding to it) here.